I have been not commenting so often lately on every little blip on the solar flare radar partly because there has not been so much activity, but also because I have written so much about this phenomenon over the years. However, when events conspire to reinforce one another, I kind of feel it is my civic duty to at least let folks know that what may appear as inner turmoil may have identifiable outer indicators, like the New Moon, partial solar eclipse (today at 5:58 PM EDT, and very large solar flares as of yesterday, one of which was an X-Class X1.6 at 10:28 EDT Wednesday. There is a very large new sunspot (AR2192) that is producing all kinds of M-Class and X-Class flares as we head into this New Moon eclipse today. And the government has sent out a warning that sunspot AR2192 is ready to erupt again over the next few days. So pardon the repetition as I go over (very briefly) the basic ideas for these celestial events one more time. The New Moon, and the days leading up to it, every month, has legends that have built up around it. In Western astrology, the three days before a New Moon were called the Devil's Days, because the "darker" forces often could be felt, along with a certain ennui and restlessness. In Tibetan Buddhism, these same three days, especially the last day (29th lunar day) is reserved for a special dharmapala, the fierce dharma protectors, practice, designed to literally protect us during those days. So we are in those days now. And to make that even stronger, we have a partial solar eclipse. The Tibetans point out that at every New and Full Moon, the subtle channels and winds within our body (and mind) come more into alignment. And alignment makes for clear channels. They go on to say that at an eclipse there is even greater alignment and still clearer channels. The tibetan's advice is to set some time apart on these eclipse days to observe our own mindstream carefully. Perhaps the clarity available at these times will allow some intuition or insight to come through of real use to us. It is up to us to actually check it out for ourselves and look at our mindstream at this time. 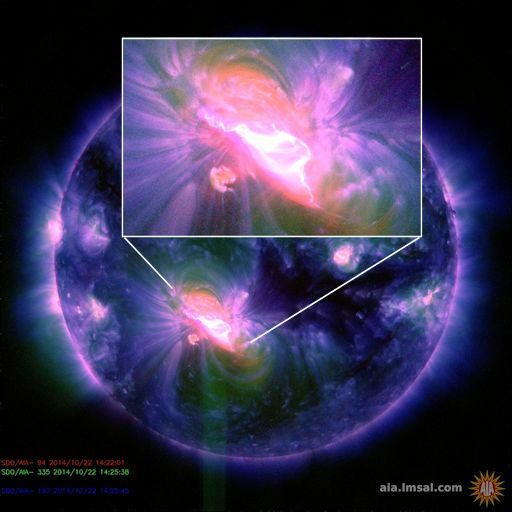 And the frosting on the cake, so to speak, is that this huge new sunspot is firing off massive solar flares which impact Earth by funneling in through the poles and disrupting communications. On the inner or esoteric sides they also mess with our mind and have effects. Simply put, sunlight and the quiet Sun feeds us its information just like it grows plants, etc., slowly. It serves to bring change into our lives in a gradual and life-giving fashion. When the sun acts up and hurls huge masses of energy directly at Earth (as it does now), we receive change, but in quantum bursts. Our problem becomes how do we absorb large bursts of change into our mindstream and life? Change is often tough. The takeaway here is simply that the New Moon, the eclipse, and these massive solar flares combine to impact us internally with the possibility of real change, something we will have to receive, absorb, and assimilate. So…..if things get a little tumultuous on the inner planes just now, don't let it confuse you or lead you to jump to any conclusions. We might best relax and work through it knowing that considering what is happening around us, we should expect something like this.